Regarded as one of the 4 great beauties of ancient China, Diao Chan is one of the classic examples of the "Beautiful Maiden Ploy 美人计". The willing pawn of Wang Yun 王允 in his grand scheme to destroy the tyrannical Dong Zhuo 董卓, Diao Chan flirted with Lu Bu 吕布 while submitting herself to Dong Zhuo as his concubine. In doing so, she pitted godfather against godson, causing severe dissension and distrust amongst them. Dong Zhuo relents that he needs the incredible combat skills of Lu Bu to maintain his power, but the mercenarial Lu Bu had little to lose. Wang Yun further convinces Lu Bu to murder Dong Zhuo and take Diao Chan for himself, which he eventually does. In some versions of the story, Diao Chan is said to have truly loved Lu Bu but became distraught on knowing Wang Yun's scheme. The original version, however, seems to state that Diao Chan knowingly wanted to kill Dong Zhuo and participated actively in Wang Yun's ploy. 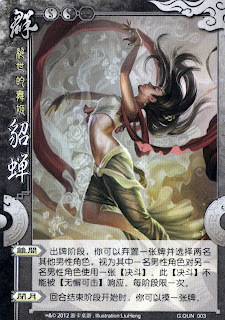 Character ability 1: " Seed of Animosity 离间 (lí jiān)"
During your action phase, you can discard a card and select two other male characters. It is then viewed as one of the players used a DUEL 决斗 on the other player. This DUEL cannot be responded to with NEGATE 无懈可击. Limited to once per phase. Character ability 2: " Envious Moon 闭月 (bì yuè)"
At your end phase, you can draw a card. The description of "Seed of Animosity" has been modified such that you cannot use it on yourself even if you have a male character card as your major character card. Note that the gender of the victims is based on the main character if both are exposed, or based on the only exposed character. But otherwise, this character is unchanged from SGS. "Seed of Animosity" is one of the best matched ability to the story in the entire game. This ability completely embodies Diao Chan's persona in the story, which is simply using her beauty to cause two men to fight each other. "Envious Moon" comes from a longer proverb used to describe the 4 great beauties of ancient China. "沉鱼落雁, 闭月羞花" which means the fish stare at them till they forget to swim and sink to the bottom, the geese forget to flap their wings and fall to earth, the moon hides behind the clouds in envy, and the flowers slink low and bow the petals in shame. Why does Diao Chan get to take one extra card for being beautiful? The same reason Zhou Yu 周瑜 gets one more card for being handsome!